For total luxury, choose the 84' Lazzara Enclosed Bridge. One of a kind custom made Lazzara. On the deck, have a drink with your guests, then relax in the Jacuzzi. The full galley features a center kitchen island, stainless steel appliances, and a seating area with a leather sofa for guests. The salon holds a large dining room table, cream colored sofas and love seats, and grand picture windows for stunning 360 degree views. 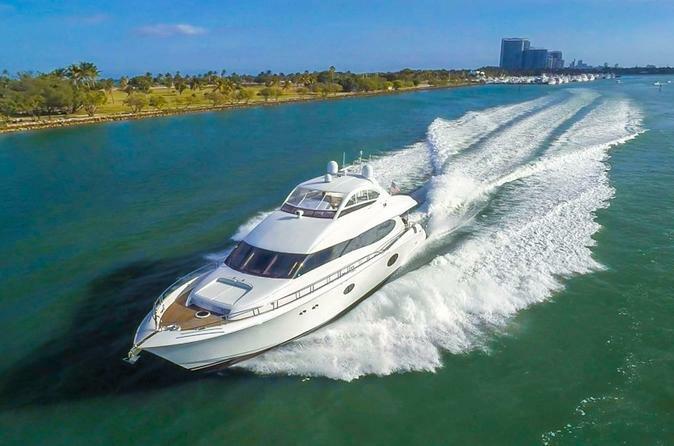 With five staterooms this boat is ideal for large group term charters. A walk around deck and spacious interior make this boat feel much larger than its already spacious size. Spend a day on the beautiful Biscayne Bay, where the knowledgeable captains will guide you through the many islands while providing commentary on the scenery. The experienced stewardess is also on board to cater to your every need so you never have to lift a finger. When you are finished learning about the area, drop your anchor and swim or jet ski. All of theÂ yachts are stocked with popular watersports equipment, and more can be provided depending on your needs. For total relaxation, be sure to contact the supplier beforehand.